Prehistoric Cupules, Cave Painting, Ivory Carvings. The oldest known prehistoric art. It dates from (290,000-700,000 BCE). 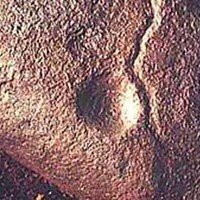 Oldest Prehistoric Art: "The Top 10"
 How is Stone Age Art Dated?  See also: Oldest Stone Age Art: Top 100 Works.  To put these ancient artworks into context, see Prehistoric Art Timeline. is the world's oldest painting. Here is a list of the top 10 oldest works of Prehistoric art created during the Stone Age. It features all the major types of Paleolithic art yet discovered, including: petroglyphs (the oldest type of cultural expression), parietal art (like cave painting, as well as hand stencils and other abstract signs) and also mobiliary art (like ivory carving and other portable forms of sculpture). Please note that any compilation of Stone Age art is bound to be both selective and subject to revision as new archeological discoveries are made. Furthermore, despite the widening range of archeological dating techniques - such as radiometric carbon dating, Uranium/Thorium and thermo-luminescence dating - not every work of art can be dated with great accuracy if the geological environment lacks important measurable elements. Thus sometimes, dating is dependent on paleontologist scholarship to provide the historical context against which an artifact's relevance and age can be assessed, through stylistic comparison with cave paintings and engravings at other archeological sites. At present, a large variety of fossils, tools and artifacts are being studied by paleoanthropologists and other Stone Age scholars, in order to fix their date of origin. The same applies to archeological sites, containing rock art like cupules, petroglyphs, pictographs and other prehistoric works. Thus this list of the earliest art by our ancestors like Homo erectus, Homo heidelbergensis, Homo neanderthalensis, and Homo sapiens sapiens - should be seen merely as a snapshot of an ongoing process of discovery. Only recently (2012), we have seen the chronology of Paleolithic art and culture changed completely by Uranium/Thorium dating tests on the cave art of El Castillo and Altamira. In addition, it seems likely that Aboriginal rock art in Australia will also - in the not too distant future - be discovered to be much older than presently thought. Sadly, none of the prehistoric rock carvers, sculptors or painters are known to us, so their works will have to speak for themselves! Also, any compilation of ancient art is limited by the hand of nature: after all, over hundreds of millennia, soft rock crumbles, pigments disappear, and wood perishes. Thus much of the finest African art and primitive "tribal art" as well as aboriginal "Oceanic art" from the Paleolithic world, are already lost to us. NOTE: One miraculous discovery occurred in 1890, in a peat bog near Sverdlovsk in the Urals, where archeologists found the Shigir Idol (7,500 BCE), the oldest surving example of wood carving. The peat had helped to preserve the wooden image from decay. Cupules carved on Hard Quartzite. Basaltic figurine - oldest known prehistoric sculpture. Rock engravings with cross-hatch designs on two pieces of ochre. Blombos Cave, 200 miles east of Capetown, South Africa. Abstract patterns, including crosshatch, engraved on ostrich eggshells. Eighteen cupules on a limestone slab covering Neanderthal tomb. Recent Uranium/Thorium (U/Th) dating techniques show that a large red-ocre dot or disk in this Cantabrian cave was painted at least as early as 39,000 BCE, making it the world's oldest cave painting yet found. Nearby hand stencils were dated to about 37,000 BCE. Monte Castillo, Puente Viesgo, Cantabria, Spain. Cave paintings of hand stencils and animals at the Leang Timpuseng Cave. The oldest art in Asia and the world's oldest hand stencil. 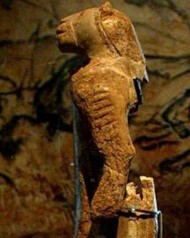 This ivory carving of a human figure with alion's head, unearthed in a cave inside Hohlenstein Mountain of the Swabian Jura, is the oldest known anthropomorphic carving in the world, and the oldest piece of sculpture of the Upper Paleolithic. Ivory sculpture of an obese female. The oldest of the Venus figurines that appeared in Europe during the Upper Paleolithic. Hohle Fels Cave in the Swabian Jura of southwestern Germany. Here is an outline of the basic timeline and dates of the Stone Age. Associated with early forms of rock art, like cupules and other petroglyphs. The earliest figurines appear, along with more complex rock drawings, ideomorphs and engravings. Neanderthal Man appears. The major period of early fine art, exemplified by portable art like the Venus Figurines, bas-relief sculpture and the polychrome cave paintings and engravings of Lascaux and Altamira. Early ceramic pottery also appears. Neanderthal man replaced by anatomically modern man, like Cro-Magnon Man. The Magdalenian period witnessed the apogee of Franco-Cantabrian cave art, with the Lascaux cave paintings and the Altamira cave paintings setting awesome standards of colouring and composition. Meanwhile, in Australia, the Bradshaw Paintings (c.15,500 BCE) appeared, along with a wide variety of pictographs and petroglyphs made by the aboriginal creators of Ubirr Rock Art in Arnhem Land, Kimberley Rock Art in northern Australia and Burrup Peninsula Rock Art in the Pilbara. Meanwhile Japanese art emerged in the form of ancient Jomon Pottery (from 14,500 BCE). See: Mesolithic Art, for details. Mesolithic was a short intervening period between the hunter-gatherer culture of the Paleolithic (Old Stone Age) and the farming culture of the Neolithic (New Stone Age), during which the ice retreated to the poles and melted. In ice-free regions, there is a shorter Mesolithic period (called Epipaleolithic) or else the Neolithic period begins immediately, leading to more sophicated sculpture, open-air rock art and the growth of clay-fired ceramics. 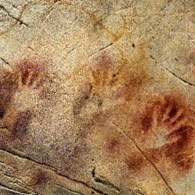 For an example of Mesolithic cave art, see Cuevas de las Manos (Cave of the Hands) dating to 7,300 BCE. See: Neolithic art, for details. The Neolithic age witnesses the beginning of civilization in the lands of Sumer, (see Mesopotamian art and Mesopotamian sculpture), Egypt and Persia, as well as the Indus Valley civilization in India. Cities like Jericho, Ur are built, requiring all sorts of architecture and forms of public art. Tomb art, exemplified by Egyptian pyramids, becomes highly developed: see Egyptian Architecture for details. Pictographs and modern systems of writing appear. Europe experiences a much later Neolithic period, and lags behind artistically. Instead of fine art, European artists and architects focus on tomb-building using large megaliths adorned with carvings, engravings and other types of megalithic art. The Stone Age ends with the close of the Neolithic. For a sculptural masterpiece from the late Neolithic of southern Europe, see the terracotta sculpture known as The Thinker of Cernavoda (c.5000 BCE, National Museum of Romanian History, Bucharest). Noted for its metallurgy, including exquisite early bronze, gold and silver metalwork, and ceramics. The first Near East civilizations (Minoan, Mycenean) appear. Trade flourishes around the Mediterranean, leading to exchange of artistic techniques and materials. Celtic Metalwork also inspires. Greek civilization flourishes on mainland Greece. From about 400 BCE - as Greek art begins to dazzle - we leave prehistory and enter great era of Classical Antiquity characterized by Greek sculpture and Greek Pottery and the more sobre style of Roman art. Early Chinese Pottery also flourished, as did the art of India. How is Stone Age Art Dated? Preliminary investigation by paleontologists of the age of a particular stone artifact or rock begins with a thorough examination of the location-site together with a study of the geological record. In order to confirm that the object is contemporaneous with the soil or sedimentary deposit in which it was found, and not a later intrusive burial in an older deposit, comparisons with other fossils, rocks and rock strata are made to establish the site's biostratigraphy. Once contemporaneity has been established the age of the object can be assessed, sometimes quite precisely, using techniques of "absolute" or chronological dating. A major type of absolute dating is radiometric dating. This relies on the fact that a number of radioactive isotopes (like uranium) are known to decay into daughter products at a known constant rate. Probably the best known example of radiometric testing of living organisms, that may have been found at the site, is carbon-14 (radiocarbon) dating, which relies on Carbon-14 absorption. A newer form used by Dr. Pike at the caves of El Castillo and Altamira is known as Uranium/Thorium dating. More recent isochron radiometric dating methods avoid the problems which can potentially result during radiometric testing. Another form is potassium-argon radiometric testing which compares the proportion of potassium to argon in volcanic rock. Thermion mass spectrometry can be used to improve results of uranium-decay dating methods. Another type of prehistoric dating method is thermoluminescence (like quartzite, flint), designed to stimulate volcanic rocks into releasing electrons from their energy 'pockets'. While regular thermoluminescence (TL) uses heat as a source of stimulation, Optically Stimulated Luminescence (OSL) uses laser light. Other dating methods include: the Uranium Fission-Track method, Obsidian Hydration Dating, Amino Acid Racemization, Patination Dating, Electron Spin Resonance and Cosmic-ray Exposure Dating.